The best days of your life are yet to happen! 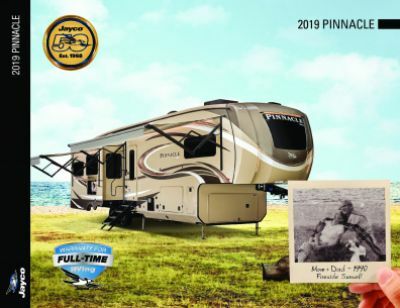 Every summer is amazing with the 2020 Jayco Pinnacle 32RLTS! It's a great 5th Wheel for traveling families, and it's available now at All Seasons RV! As one of the largest RV dealers in the Midwest, you'll find a wide array of the nation's top brands! You can browse through our massive RV inventory on our site, or see them all for yourself on our lot at 4701 Airline Rd Muskegon Michigan 49444! Even if you don't live near Muskegon, MI, you can still enjoy the use of our 24/7 nationwide delivery service! To talk to our Pinnacle expert, just give us a call at 231-739-5269! We'll get you in the RV of your dreams in no time at all! The handsome 2020 Jayco Pinnacle 32RLTS is easy to tow and ready to go, thanks to a hitch weight of 2470 lbs. and GVWR of 15500 lbs. The easy opening 16' 0" patio awning provides comfort and shade for relaxing outdoors! Nothing beats a great night's sleep when you're camping, and the superb bedroom in this RV is designed to give you just that, with its roomy King bed and beautiful furnishings! This roomy camper can sleep up to 4 people! Before you leave home, fill up the 75 gallon freshwater tank for an abundance of clean water to drink and wash with throughout the trip! This RV's kitchen has a 21.00 cu. ft. refrigerator for storing fresh food and cold drinks, and a 3 burner range cooktop to cook up delicious dinners! You go to the bathroom several times a day, so wouldn't you want it to be close by, private, and comfortable? 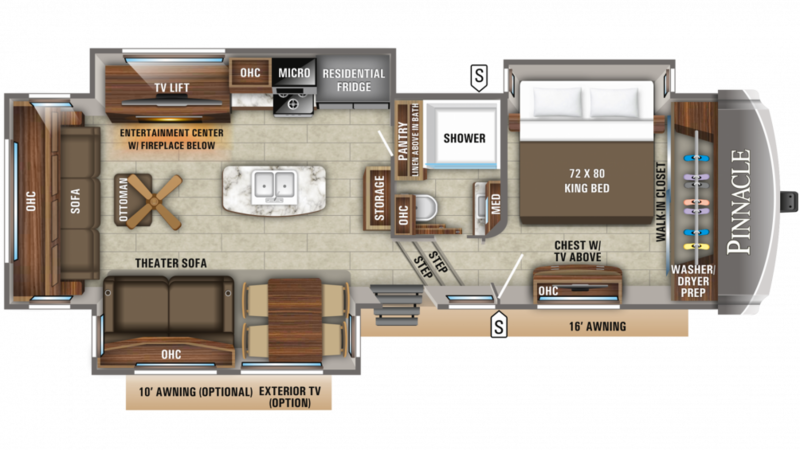 You'll get all that with the full bathroom in this RV, complete with a Porcelain Foot Flush toilet and a roomy shower! With 60 lbs. of LP tank capacity, you'll enjoy hot, steamy showers every morning on your vacation! The 87 gallon gray water tank and the 50 gallon black water tank help you avoid dealing with waste and used water while you're having fun on the campground!